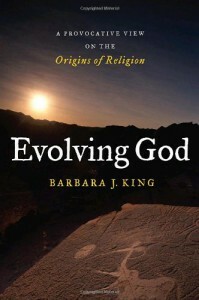 Barbara King argues in this book that humans evolved a need to believe in something that transcended physical reality and the concrete bonds between individuals within family and tribal groups, and that this need is expressed as “religion.” “Religion” is a fairly slippery term but for purposes of her argument, King defines it as “a system of symbols which acts to establish powerful, pervasive, and long-lasting moods and motivations in men by formulating conceptions of a general order of existence and clothing these conceptions with such an aura of factuality that the moods and motivations seem uniquely realistic.” (based on Clifford Geertz’s definition) (p. 18) Thus, it’s possible to encompass the first evidence of ritual in hominid life as well as the most involved theology of a literate, urban, 21st century civilization. Much of the book is taken up with finding evidence for the four cognitive abilities that King believes form the basis from which religion springs: the primate need to belong (expressed by the awkward “belongingness”). “Empathy” – the ability to walk a mile in another’s shoes – is the first characteristic, and King points to many examples (not just among primates) in the animal kingdom. The second ability is “meaning-making,” which is an animal’s ability to convey meaning through gestures, vocalizations, posture, etc. Primates are quite good at this – humans most of all. Not only do we make meaning about immediate events (e.g., “stop messin’ with my girl,” “I’m hungry,” “ha, ha, ha, that’s funny”) but we impute deeper purposes to things (e.g., “this ring means he loves me,” “God caused our crops to fail because we failed to obey the Law”). The third factor is the ability to make and enforce rules. Humans are, again, masters at this but King presents evidence for rudimentary rule-making in our ape cousins. The final pillar upon which “belongingness” (and hence religion) rests is the capacity to imagine. There’s some really fascinating information here about chimpanzees imagining companions and toys that reveal just how narrow the gap between us and other animals is. (pp. 56-58) All these come together to make us (primates) the quintessential social animal. Despite a relative lack of imagination and innovation, there is evidence that Neandertal and other pre-sapiens hominids had diverse cultures: bear cults at Regourdou, deep-cave activities at Bruniquel or cannibalism at Moula-Guercy. (pp. 122-126) There’s evidence for this among modern chimps, as well – some of whom use a particular toolkit while others in similar environments do not. Sedentism and communal living preceded agriculture but when human societies began that fundamental switch to farming, a qualitative change occurred that transformed religion. King only touches on this, mentioning the enormous temple complex found at Gobekli Tepe in Turkey that’s at least 10,000 years old. The relationship between socialization, religion, “belongingness” and all the other components that make up human cognition and culture is not linear but a complex interaction that involves a little understood system of feedback and mutually reinforcing relationships. In her chapter “Is God in the Genes,” King makes a very strong case that there is no “God gene.” There isn’t even a package of genes that make us religious. At most, our genome predisposes us to act and perceive in certain ways expressed spiritually and in religion. In sum, this is an interesting book and definitely recommended to those interested in the “religious” sensibility and human evolution.